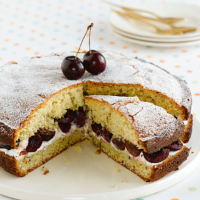 This moist cake has a light yogurt filling, which tastes really good with the ripe cherries. Preheat the oven to 180°C, gas mark 4. Lightly grease a deep 23cm-diameter cake tin and line the base with baking parchment. Beat the butter and sugar together in a large bowl until light and fluffy. Gradually beat in the egg, a little at a time, until it is fully incorporated and the mixture is smooth. If the mixture starts to curdle a little, simply add a spoonful or two of the flour and carry on adding the egg. Fold in the flour, pistachios and ground almonds. Spoon the mixture into the prepared tin and bake for 40-45 minutes, until golden and springy to the touch. Remove from the oven and leave to cool for 10-15 minutes. Turn the cake out onto a wire rack and leave to cool completely. Cut the cake in half horizontally and spread the yoghurt over the base. Scatter over the halved, pitted cherries. Sandwich with the remaining half of cake. Dust the top with icing sugar and decorate with the reserved whole cherries. Cut into slices using a sharp knife.